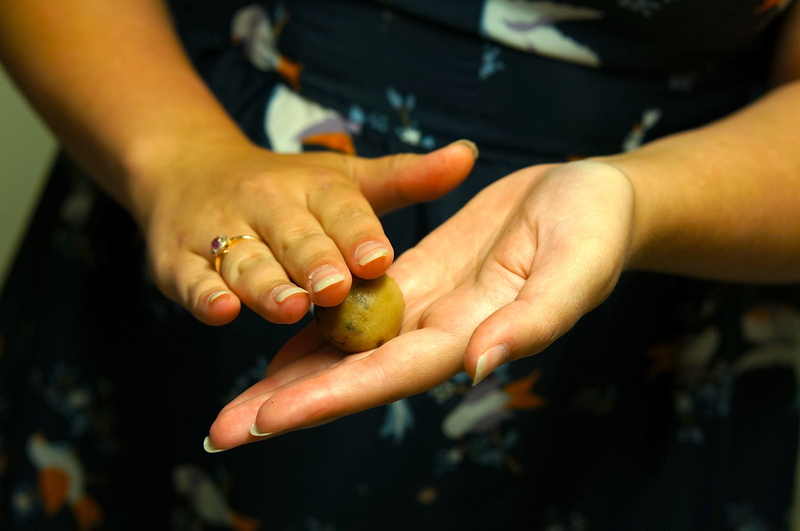 As you all well know, we have a bit of a fondness for hiding baked goods inside of other baked goods. We put candy bars in brownies, brownies inside of a cupcake, Cadbury Creme Eggs inside cupcakes… the list goes on. We don’t know why, we guess we just like the fun surprise. Oh you thought you were biting into a cake? Just kidding- it’s a brownie! It’s exciting. We knew we had to try these chocolate chip cookie dough cupcakes when we saw them on Pinterest. 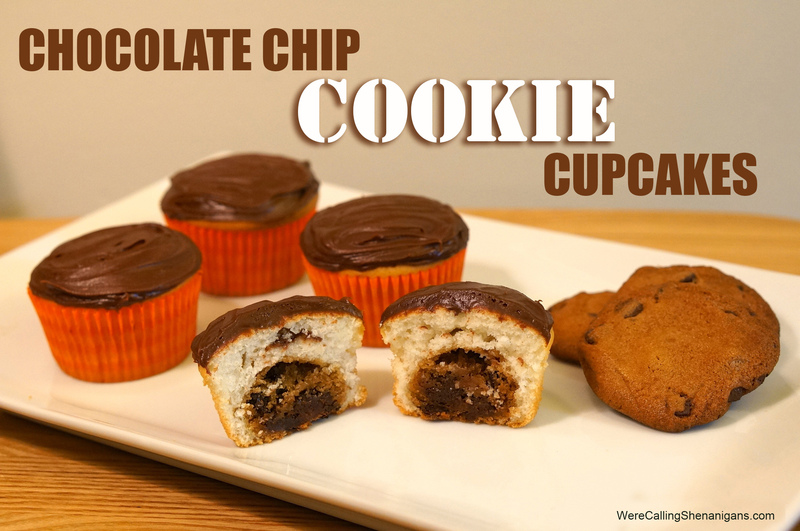 We mean, we love cookies and cupcakes, why not combine them into the same dessert? According to the original pin, if you put cookie dough into cupcake batter it stays ooey-gooey in the middle of the baked cupcake. We decided to call shenanigans and see if it worked! Prepare the cake batter according to the directions on the box. 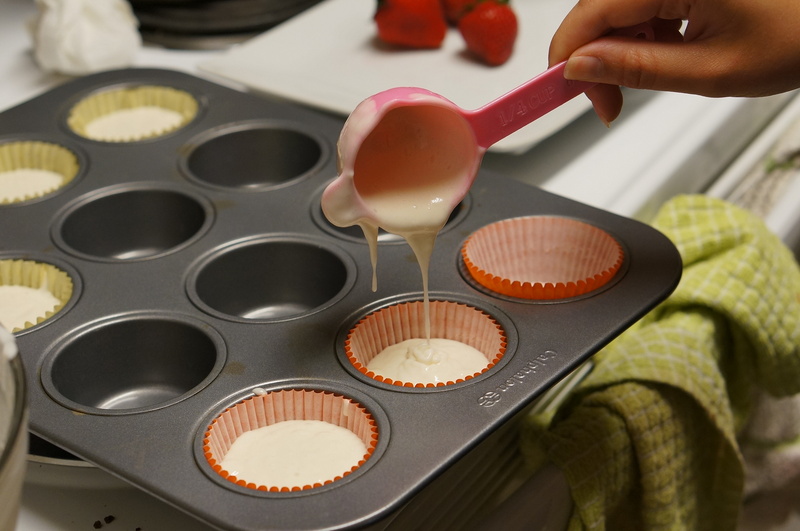 After lining the cupcake pan with cupcake liners, fill the cupcake pockets about 2/3 full. 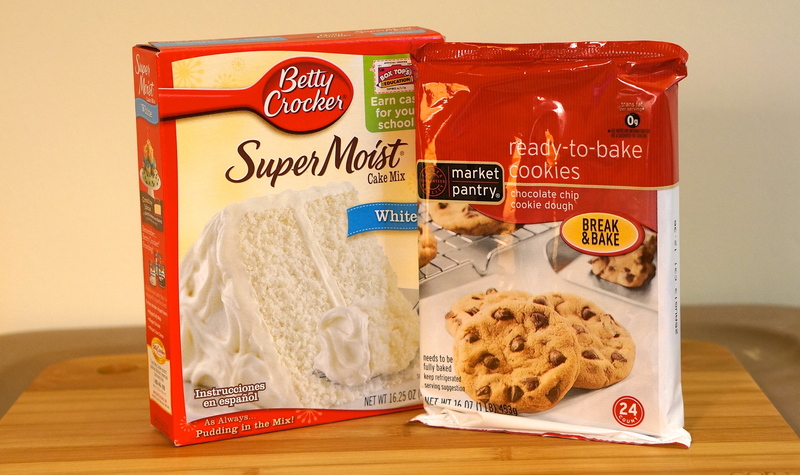 Now, break up your cookie dough and roll it into as many 1 inch balls as you have cupcakes. 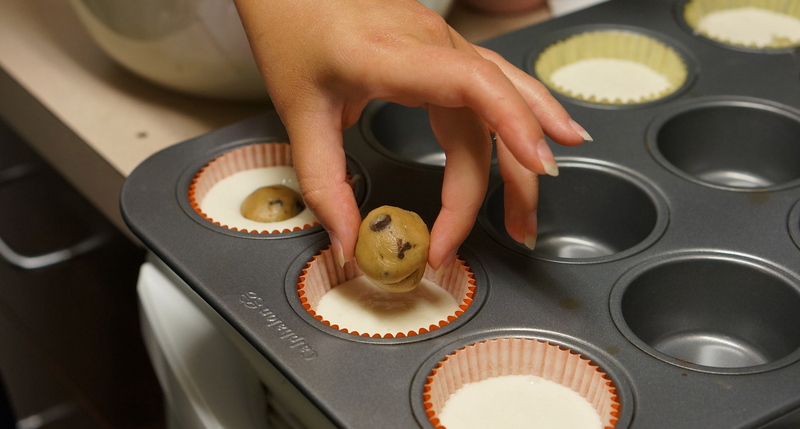 Gently place each cookie dough ball into a cupcake pocket on top of the cupcake batter (they will sink- don’t push them down!). Bake the cupcakes according to the package directions and you’re all done! 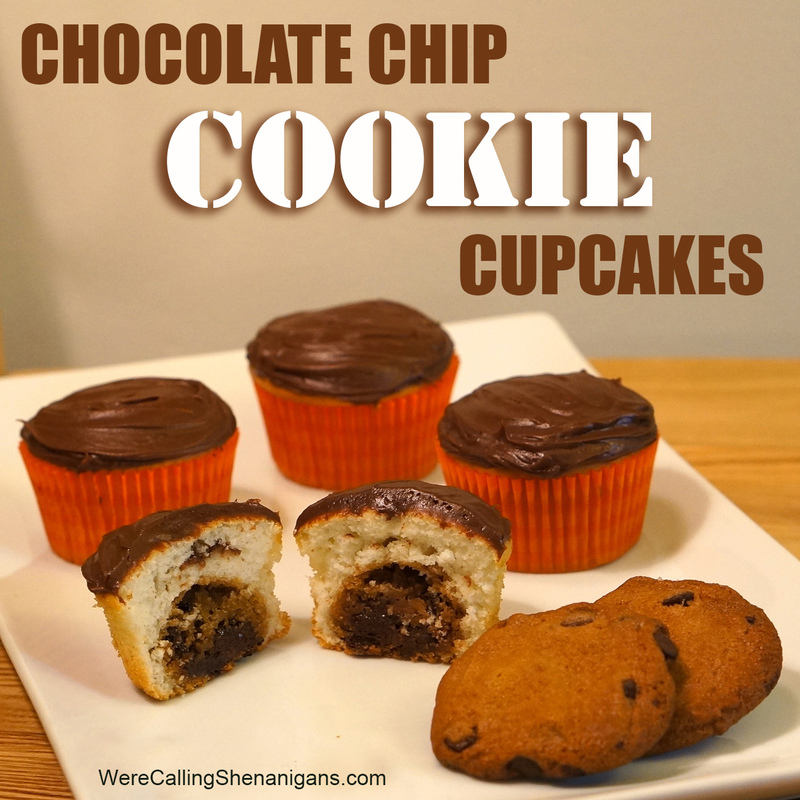 This shenanigan turned out OK… they were really more like chocolate chip cookie cupcakes than chocolate chip cookie dough cupcakes. Rather than staying doughy, the chocolate chip cookie dough just baked with the rest of the cupcake and turned into an actual cookie. It was still delicious, just not what we were going for. Overall, this shenanigan was fine- it was still fun to bite into the cupcake and get the surprise of the cookie, we just wish they had lived up to the hype and been doughy. What a great idea! Who doesn’t like chocolate chip anything. Can’t wait to try them this summer. I have heard that to keep the dough doughy, you should freeze it before baking, and drop the still-frozen balls of dough into the cupcakes. This kind of worked when I tried it, but I think I had accidentally let some of the dough thaw.